Four years ago I saw a need for a guidebook that addressed how to best navigate the ever-changing shallows of the ICW. 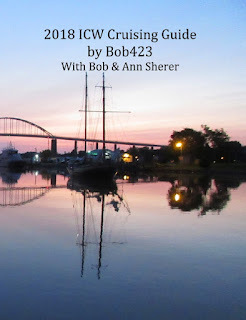 There was plenty of coverage of marinas, anchorages and such by books like the Waterway Guide series but very little to address the details of how to navigate the always changing shallows of the ICW. Over the years I accumulated routes for deeper water and wrote my first book in 2015. Safe passage routes change every year through the shallows of the ICW. The guide provides a full-page chart for each hazard in color with my route in the spring of 2018 shown as a red dotted line. You will know my exact path in finding the depths I report in my guide. All charts have been redone using Aqua Map’s excellent charting database available through either their iPad or Android app. Their charts are updated four times a year, a must on the ICW. Bridge clearances have been tabulated and shown in graphical format. On my 2018 spring trip northward, I took a photo of the height boards on every fixed bridge. 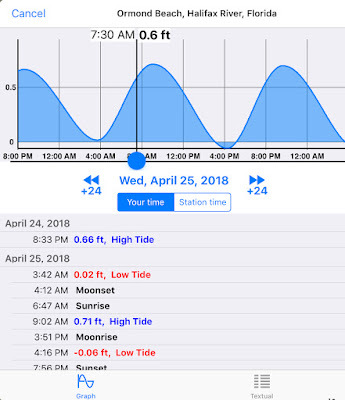 I noted the day and time I passed under each bridge which I used to compute the clearance at high tide and also at 0.0 tide. 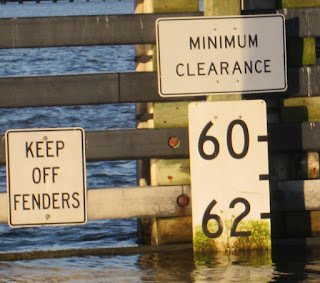 The results surprised me on how many bridges had less than 65 ft of clearance, even at low tide! The list of best navigation apps has changed dramatically from 2017. The new player on the block, Aqua Map, has leaped over competitors in many features (but I still use Navionics too). A complete comparison of can be found at 14 iPad Navigation Apps Evaluated. More GPX routes have been added for downloading. With Aqua Map, the download of a GPX route could not be simpler from a link provided on the Waterway Guide Alert icon for a shallow area or from the list of GPX Routes on this blog site. GPX downloading instructions can be found at GPX File Use. I Joined Waterway Guide as an On-The-Water Editor, I’ve updated many Waterway Guide Alert icons for current information as referenced in the guide and will be maintaining them through the year to reflect current conditions at an Alert location. All sections have been updated. Products evolve and what was best last year may not be best this year. However, not everything changes and much of the “getting ready” steps for setting out remain familiar from last year. The eBook is free when you purchase the paper version of the guide. Amazon will recognize if you bought the paper version and will allow the eBook to be downloaded at no charge. All the links you see underlined in blue are active links in the eBook. It’s a great time saver in looking up my recommendations on apps, marinas, restaurants, and electronics. 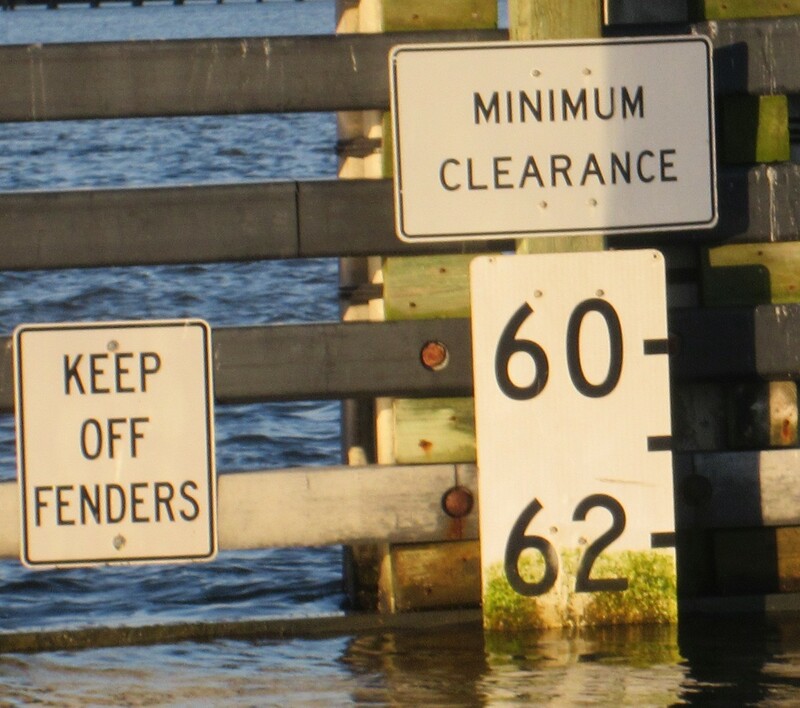 All fixed bridges on the ICW are supposed to give 65 ft of clearance at high tide except for the Julia Tuttle Causeway in Miami at 56 ft. Unfortunately, “supposed to” does not conform to reality on the ICW. In the spring of 2018, I took photos of every fixed height bridge from Ft Lauderdale to Hampton, VA. I noted the date and time of the photo and arranged them in a spreadsheet. 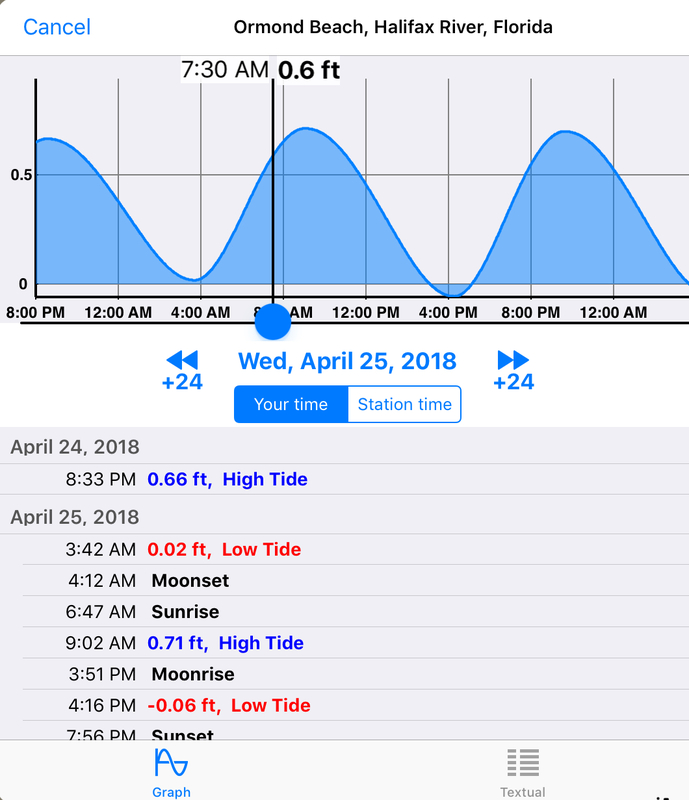 I then looked up the tide at the time and computed the bridge clearance at the highest tide of the day per the nearest tide station and for a 0.0 tide. Unfortunately, there were 15 bridges that did not have height boards. Obviously, they were not included. As an example of one with height boards, let’s look at the International Speedway Blvd in Daytona at MM 830.1. I came through the bridge on 4/25/2018 at 7:29:21 EDT and took this photo of the height board. I figured the clearance to be 62.8 ft. I then found the nearest tide station, Ormond Beach in the Halifax River which is 4.6 Nm north. The nearest tide station to the south is Ponce Inlet on the Halifax River at 9.2 Nm away. 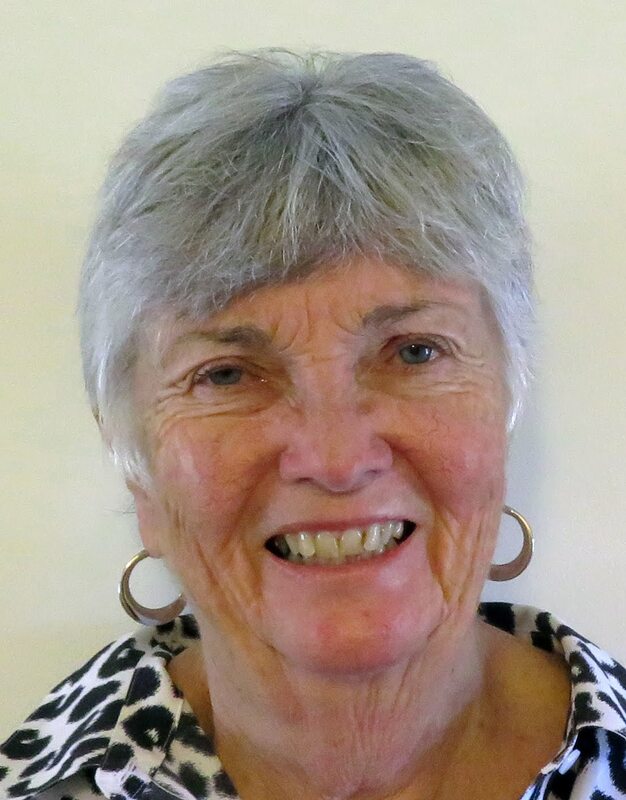 I chose to use the closest tide station, 4.6 Nm north. There are many examples in the book with a tabulation of all such bridges and a graph showing heights for each bridge at low and high tides. Compiling this data was rather exciting while going under bridges at all hours and always being ready to snap a photo. Aqua Map has the handy feature of giving a popup of date and time at a point on a track just by tapping that location. I can tap the track by a bridge and compare that date and time to the time stamp from my camera to double check that I have the right photo matched to the right bridge. I thought all this data might be useful to some cruisers along the ICW.